I know I posted a few months ago a way to alternate row colors with PHP (which is kinda nice), but lets be honest, mixing CSS + PHP is not as beautiful as pure CSS. 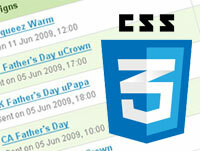 If you might want to check that article if CSS3 is not an option for you. Magic isn’t it? I will make sure to post any other cool CSS3 solutions whenever I find them around. Cool stuff: The new Google Chrome logo made only with CSS3.